PAN India BSNL has announced the launch of Festival Voucher on account of ‘Ramadan 2016’ for Prepaid mobile customers as promotional basis. State run Telecom Company Bharat Sanchar Nigam Limited (BSNL) introduces ‘Ramadan Special Combo Voucher 786’ in all Telecom Circles for Prepaid mobile customers from 6th June, 2016 onwards. 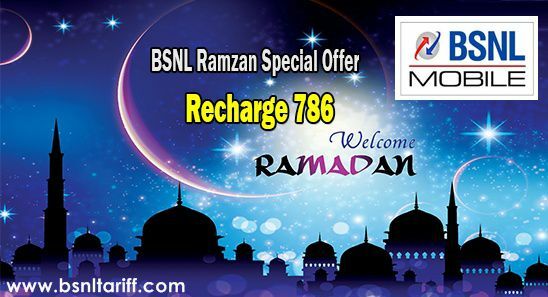 As usual BSNL is introducing this ‘Ramadan Special Combo Voucher 786’ every year for Muslim brother and sisters offering Full talk value as well free SMS to make voice calls, send SMS and Free data usage at affordable rates. As per latest information, BSNL Competent authority has decided to launch Special Combo Voucher 786 on account of upcoming Festival ‘Ramadan 2016’ as promotional basis for a period of one month from 6th June, 2016 onwards in all Telecom Circles. Ramadan Special Combo voucher 786 offers, Talk Value of Rs.600 + 786 Free SMS + Free 786Mb free 3G/2G data usage with validity of freebies 30 calendar days. The above Ramadan Special Combo Voucher 786 will be implemented with effect from 6th June, 2016 and available upto 6th July, 2016 for Prepaid plans mobile customers in all Telecom Circles. Note: Customer are advised to activate the above voucher through Flexy Recharge (Easy Recharge) Only.